"For more than a decade, Ron Deibert's Citizen Lab has been at the forefront of decoding actions both crude and subtle to disrupt Internet access and usage. A path from the Dalai Lama's hacked laptop to a worldwide espionage ring is but one tale of many of the Lab's singular exploits -- now gathered here in this compelling volume that chronicles the ongoing wars amidst the Internet's rise." The paperback version of Black Code: Inside the Battle for Cyberspace will be available for purchase on November 19, featuring new cover art, a timeline of British/American surveillance and a new author's note on the NSA revelations. Black Code is also available as an e-book and a hardcover. Click here for purchase information. Read about the book | Read the excerpt. 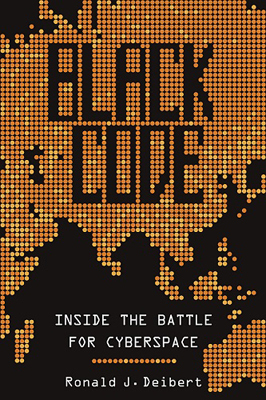 Black Code: Inside the Battle for Cyberspace is now available in all major bookstores. Click here for purchase information. Cyberspace is all around us. We depend on it for everything we do. We have reengineered our business, governance, and social relations around a planetary network unlike any before it. But there are dangers looming, and malign forces are threatening to transform this extraordinary domain. 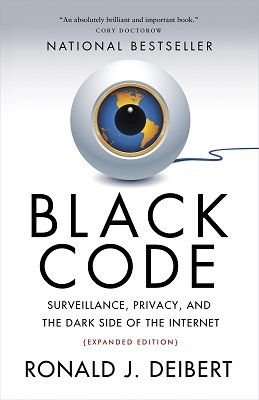 In Black Code, Ronald J. Deibert, a leading expert on digital technology, security, and human rights, lifts the lid on cyberspace and shows what’s at stake for Internet users and citizens. As cyberspace develops in unprecedented ways, powerful agents are scrambling for control. Predatory cyber criminal gangs such as Koobface have made social media their stalking ground. The discovery of Stuxnet, a computer worm reportedly developed by Israel and the United States and aimed at Iran’s nuclear facilities, showed that state cyberwar is now a very real possibility. Governments and corporations are in collusion and are setting the rules of the road behind closed doors. This is not the way it was supposed to be. The Internet’s original promise of a global commons of shared knowledge and communications is now under threat. Drawing on the first-hand experiences of one of the most important protagonists in the battle — the Citizen Lab and its global network of frontline researchers, who have spent more than a decade cracking cyber espionage rings and uncovering attacks on citizens and NGOs worldwide — Black Code takes readers on a fascinating journey into the battle for cyberspace. Thought-provoking, compelling, and sometimes frightening, it is a wakeup call to citizens who have come to take the Internet for granted. Cyberspace is ours, it is what we make of it, Deibert argues, and we need to act now before it slips through our grasp. Click here to purchase Black Code.